The Childers Team: Staff Spotlight on... Sherry!The Childers Team: Staff Spotlight on... Sherry! You are here: Home / Our Blog / About Our Office / The Childers Team: Staff Spotlight on… Sherry! The Childers Team: Staff Spotlight on… Sherry! 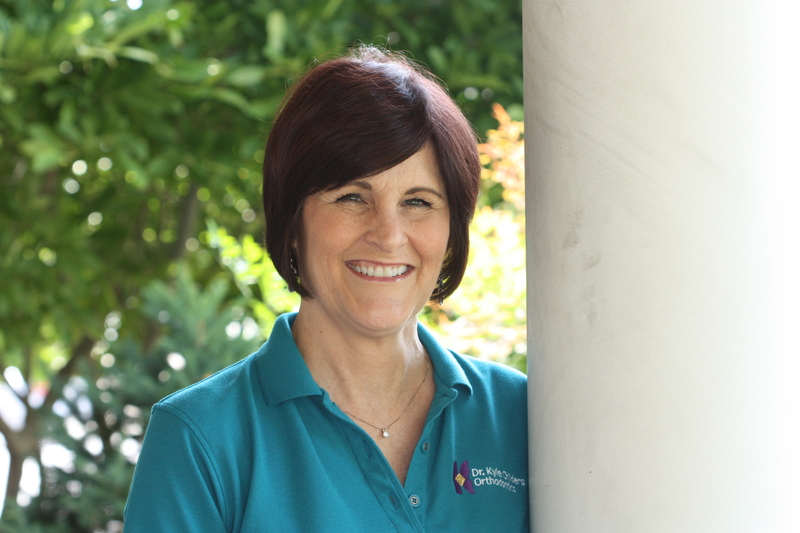 Sherry, a Registered Dental Hygienist, is another one of our loved Childers team member at Childers Orthodontist. Get to know her as we know her. I was named after a horse….Sharon’s Highland Rose, the pride of Sharon’s Farms, which shows quarter horses. That’s what happens when you are the first granddaughter born. Favorite actor has to be Patrick Swayze…how can you not love Dirty Dancing? My husband and I saw the movie Amadeus for our first date. My most memorable childhood event…our one and only family vacation in Colorado, driving all the way back to St Louis with a huge boulder in the floorboard of the back seat that my mother HAD to have for landscaping. I had my feet on top of that stupid rock the entire time! I wanted to be a Special Ed teacher but there were not any teaching jobs. Dental Hygiene was my second option. If I listen too closely to the words of many songs while singing them I will always cry. They make fun of me in choir………….anything patriotic does the same thing. Not too much of a sweets eater but LOVE crunchy and salty! https://childersbraces.com/wp-content/uploads/2015/08/childers-orthodontics-sherry.jpg 450 675 DrCAdmin https://childersbraces.com/wp-content/uploads/2016/10/logo-childers-orthodontics.png DrCAdmin2014-10-02 15:09:252019-03-04 08:38:31The Childers Team: Staff Spotlight on... Sherry! October is National Orthodontic Health Month Childers Team: 25 Fun Facts About Brooke!